Pasta is always a favourite go-to ingredient for a quick and easy meal as there is always so much you can do with it. 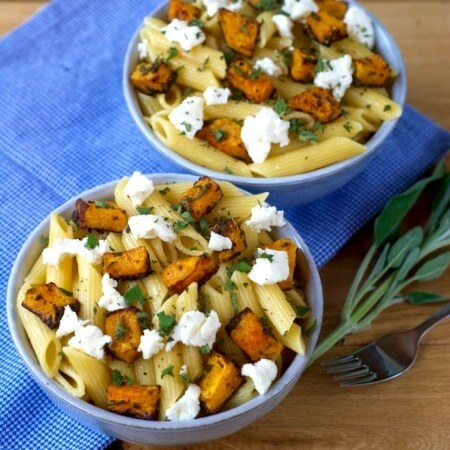 This Roasted Butternut Squash Pasta is a comforting winter warmer and a good way to get some extra vegetables into your diet. Here we have another comforting and warming dish for you which is also very light and healthy too. Butternut squash, when roasted, takes on an amazing taste (don’t all vegetables taste better roasted?) and when combined with the fragrant (and often underused) sage and topped with creamy ricotta, it is really delicious. Put all of that in with a really good quality pasta and you have yourself a fantastic meal. Everyone loves pasta! Well, I’m pretty sure everyone does! I haven’t met anyone that doesn’t. There are so many different types and so much that can be done with pasta that there is something for everyone. We decided to keep this recipe simple and it only uses a few ingredients, but the combination of flavours is really good. The Italians keep all their dishes simple, so if it is good enough for them! Did you know that pasta can be dated back to as early as the 1st century AD? That’s crazy! In the writings of Roman poet Quintus Horatius Flaccus, he talked about lagana, which were fine sheets of fried dough and were an everyday foodstuff. Pasta making machines were made in the city of San Remo, on Italy’s north-eastern coast, since the 1600s. Suffice to say, pasta is an enormous Italian tradition and we are thankful for that! You will probably all know know that we like to use good quality ingredients, and even a simple pasta dish is no exception. For this recipe we used Italy’s number 1 pasta brand, Barilla. Barilla has produced durum-wheat pasta for more than 100 years, taking utmost care of quality, as it always has done, selecting the best wheat available and carrying out all the production processes up to the final check in the most efficient way. And such care results in great pasta, with ideal texture, able to hold up perfectly to cooking, and giving the best results in all recipes. Barilla’s range of pasta is huge and it all cooks so well that it is perfect for all pasta dishes, from quick mid-week meals to any special occasion. We used the Penne Rigate, which would normally be used with a sauce, but still works so well with a simple topping like this one. If pasta is a staple in your house, then it’s important to use a good quality brand. For us, that has to be Barilla. Widely available, delicious and versatile. Keep your cupboards stocked up with it. They also do some really delicious pasta sauces if you are short on time and looking for something convenient. You really don’t have to over complicate pasta dishes with lots of different vegetables, an over-the-top sauce, or more than one cheese. Keep things simple and let the star ingredients really shine through. You will be seeing more sage recipes on the blog too, as we have discovered how much we love it recently. This Roasted Butternut Squash Pasta is a comforting winter warmer and a good way to get some extra vegetables into your diet. Put the pasta in a pan of boiling water and cook until done. Mix the roasted butternut squash in with the pasta. Serve topped with the ricotta and remaining sage. This sounds delicious! I love butternut squash and sage. Love the look of this! Love the taste of butternut squash but only ever cooked it in a curry myself. Will have to try this! 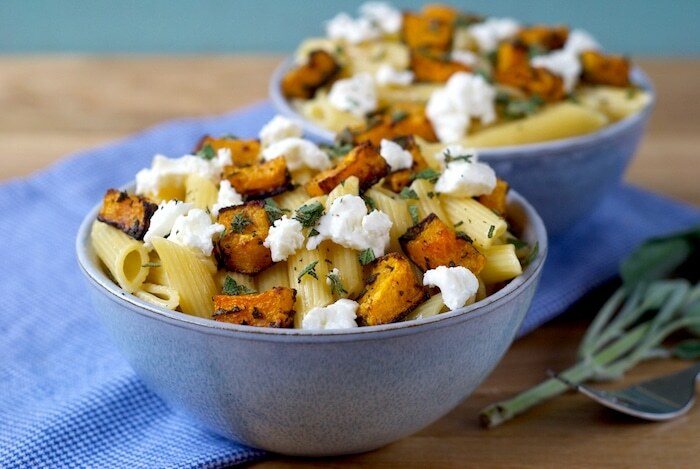 This looks so delicious – I love butternut squash and feta! I love how the Italians use just a few ingredients in their pastas – to let the quality of the ingredients shine through! It also means you always have something in your fridge that you can pull together to make a tasty pasta dish. Great combo of flavours here, guys!